The Foot Wheel was developed to soothe tired, achy feet in seconds. The miracle of myofascial release makes it a must in the management of plantar fasciitis. The Foot Wheel has 2 trigger wheels and 2 spindles. It is 4.4" in length. 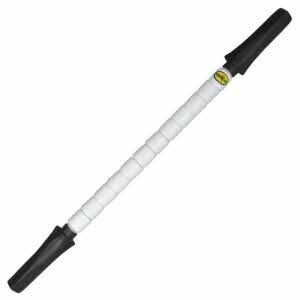 The Litle Stick is the smallest 2-handle model presently available. Its 14" length and 6 working spindles make it ideal for children. 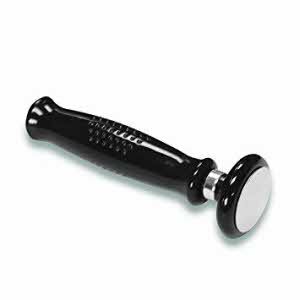 It is highly effective in the management of growing pains as well as shin splints. 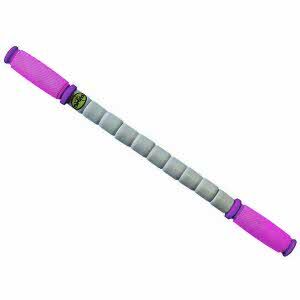 The Marathon Stick is very flexible and perfect for the athlete that is lean and mean! It has fantastic flexibilty which allows for pin point accuracy! This model was created for world-class distance runners. It has very comfortable yellow handles, measures 20" and has 10 spindles. The Travel Stick is an excellent choice for the travellers among us. It is short and very light. it can fit into any suitcase or travel bag. The standard flexibility allows for an excellent massage at any time, anywhere. 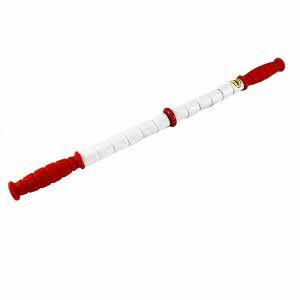 It has comfortable red handles with 8 spindles and 17" Long. It has recently been popularized by the USA Cycling team for use on the lower limbs. The Computer Stick is most flexible medium model is engineered for the computer athlete. It is 22” and comes with a SeatPlate anchor to facilitate unassisted management of the upper limbs.